PVC Trunking Single Screw Extruder Plant offeredis made available by us under different model choices with different screw speed variation (rpm), minimum/maximum pipe OD (mm), plasticizing capacity (kg/hr). 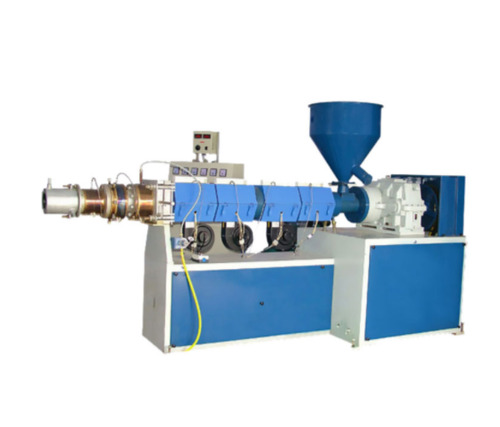 Some of the standard features of the single screw extruder plant include barrier design screw that provides for consistent melt homogeneity and excellent process control, availability in different screw diameters from 20mm to 150mm, providing support for processing all pelletized materials and providing high output rate for polyolefin up to 450 Kg/hr. Further, these extruder plants come with different die-heads to handle pipe sizes from 16mm to 160mm, vacuum tank and water tank based cooling units, cutting saw fitted with pneumatic cylinder for proper gripping support, tipping chute coming fitted with pneumatic cylinder for proper gripping and others.Our PVC Trunking Pipe extrusion line is offered in various models having different values of minimum, maximum pipe OD (mm), max plasticizing capacity (kg/hr) and screw speed variation (rpm). Barrier design (Double thread) Screw for PVC Trunking Pipe for consistent melt homogeneity, excellent process control and stability for uncompromising end-product quality. Broad range of extruders with screw diameters from 20mm to 150mm. Designed to process all pelletized materials. Output rate for polyolefins up to 450 Kg/hr. Die head for smaller sizes of pipe ranges from 16mm - 50 mm with stainless steel spider. Die head for bigger sizes of pipe ranges from 40mm - 160mm with stainless steel spider. Vacuum tank for smaller sizes of pipe ranges from 16mm - 50mm for better control and proper sizing of the pipe. Drive is given through separate geared motor for both the rollers of the haul off. It prevents wrinkles on pipe and give smooth flow of the pipe. Fitted with pneumatic cylinder for proper gripping.